When Harper was about eighteen months, she would get so frustrated and hit her head on the floor because she was having a hard time communicating. I would know later that it was because she couldn't hear. Will Holden's speech is starting to really take off. He is learning new words every day and I have noticed there is a light in his eyes when he says something and I understand it and meet whatever need he has. If he asks for his "bup" (cup) and I immediately give him the cup - he gets such a sweet look of happiness on his face as if he is thinking "you understand me!" I learned with toddlers when the fits start happening that one of the best ways to handle them is to validate what they are feeling. If they can't have the candy they are wanting and you say to them, "I'm sorry you want the candy. It's so not fair that you want candy and mommy is saying no. It would make me mad too but it's not good to eat candy right now." Often they just need their feelings validated and it calms them down. I think there is a little child in all of us. Don't we all just want to be understood? Isn't having our feelings validated so important? When you are feeling rundown as a mom of young kids and exhausted and like you have given everything you have to give and you are dreaming of just spending one night in a hotel all alone with room service - there is nothing that helps more (than the actual hotel room) than to hear someone else (especially someone you think that has it all together) share that they are feeling the same way. When you are single and all of your friends have been married for years and you feel like you will never find the right person and wondering what is wrong with you - something as simple as someone else who has been there and gets why you feel left out of so many situations can make such a difference. When you or your child are struggling with a long term illness - finding someone else in the same shoes who can understand or offer suggestions is so much more meaningful than almost anything. We all want to feel validated. And we all want to feel valued. 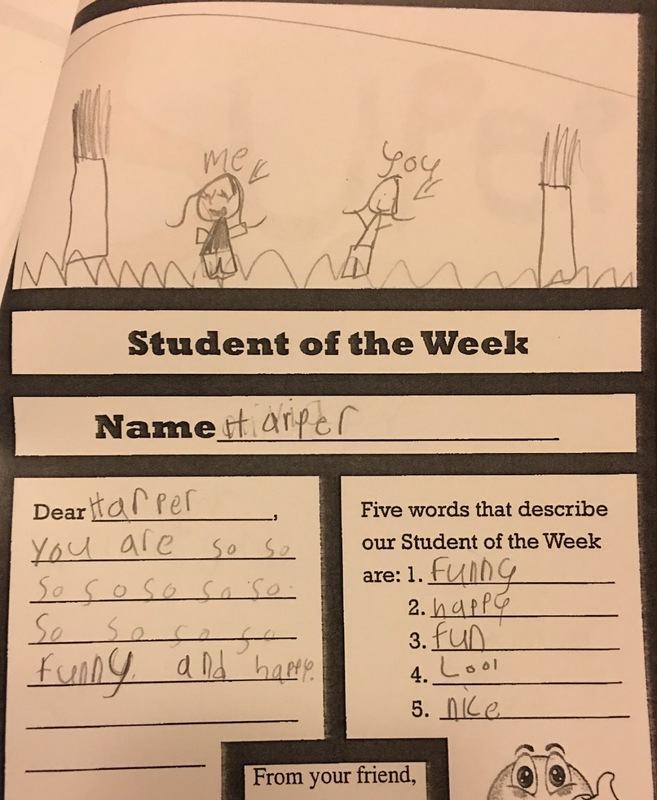 Harper's 2nd grade teacher does the most amazing thing. Each week they have a student of the week. The class makes a poster where they call out things about that student that they like or admire. And they all sign and give it to them. I knew about that because she posts the picture each week on a class app. But what I didn't know was that each week the class makes the student a book. They each have a page where they draw a picture of the student and give 5 adjectives and write a sentence or two about that boy or girl. Harper came home with a book of 20 pages with kids writing things they liked about her. I could not treasure anything more. And in an age where bullying is such a problem - to give children a sense of belonging and admiration from their peers is priceless. I hope that children who so need to hear words of encouragement soak in these words from their classmates and remember them. Don't we as adults wish our friends would make us a book to know we are loved and validated and valued? It's so much easier to speak words that cheer someone on then to break them down. To make them feel understood and loved. Let's follow the lead of these 2nd graders and share some positive with those around us this week. What a difference we could make.